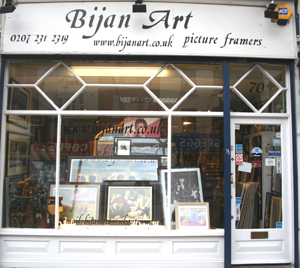 Bijan Art Ltd. has been providing a wide variety of framing and related services to business clients as well as directly to the public in London for over 20 years. We pride ourselves on our first class workmanship at competitive prices, as well as our friendly and knowledgeable service where each customer is treated with the respect that he/she deserves. All framing work is carried out at our premises, where clients are always welcome. For emergencies or extremely urgent requirements, we offer an exclusive Same Day Service. At Bijan Art we offer you more choices, fast service and guarantee that we will not be beaten on quality or price, on a like for like basis. ASK US FOR AN ESTIMATE and you won't be disappointed. We are very proud of our picture framing services and it is a testimony to our highly rated skills that much of our picture framing undertaken is from repeat customers. We will work hard to ensure that YOU will want to return to Bijan Art, Picture Framers, for all of your framing needs.